Last night, we held a happy hour for our clients, friends and Seattle area professionals at Flatstick Pub in Pioneer Square - one of our favorite places in the Downtown Seattle area. We share a collaborative workspace in South Lake Union and are thrilled to have Flatstick Pub as our clients, friends and partners, so it was an honor to host our inaugural co-branded event in their Pioneer Square space. 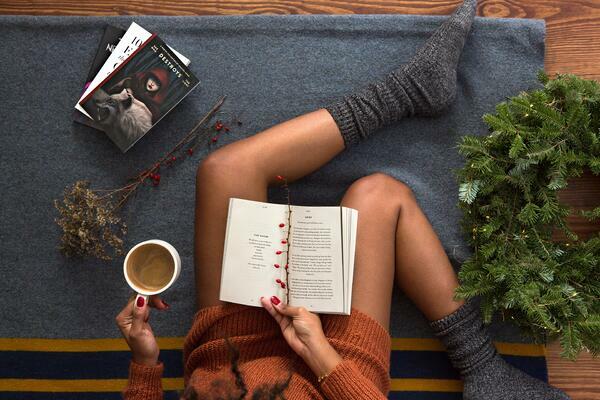 Reading is the ultimate underrated pastime. Weeks, months or even years can pass by and you don’t even realize that you haven’t read a book. Then, when you go to pick out a book, you realize you don’t want to spend more than $10 on something you may only use once. 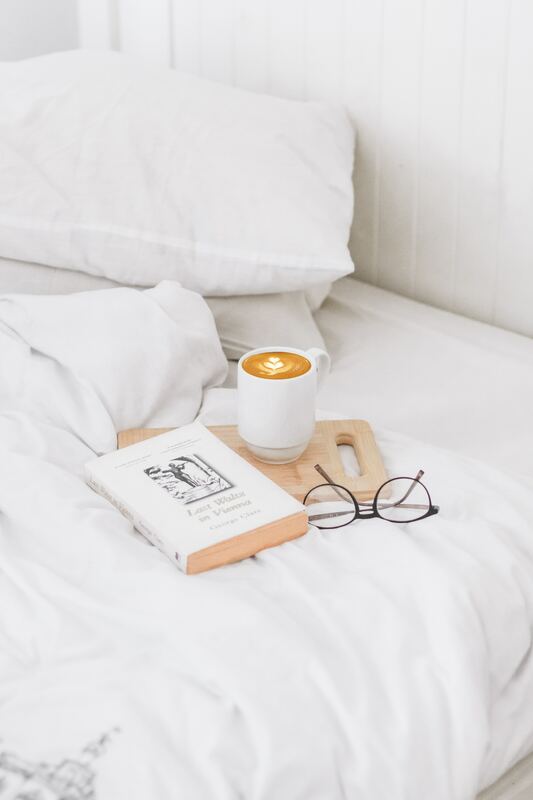 So, here are 5 tips and tricks for saving some money on books! Our March Wallpaper is Here! Our lovely and talented graphic designers created original desktop wallpapers for each month of the year. Here's our free March desktop background! Make promo products go to work for you. It's one of the easiest, fastest and most hands-off ways to advertise your company in the long term. - Flyers get thrown in the trash. Business cards pile up. Promo products - those people use. A promo product is basically any piece of merchandise with your company or brand name, logo, slogan, design or messaging on it. 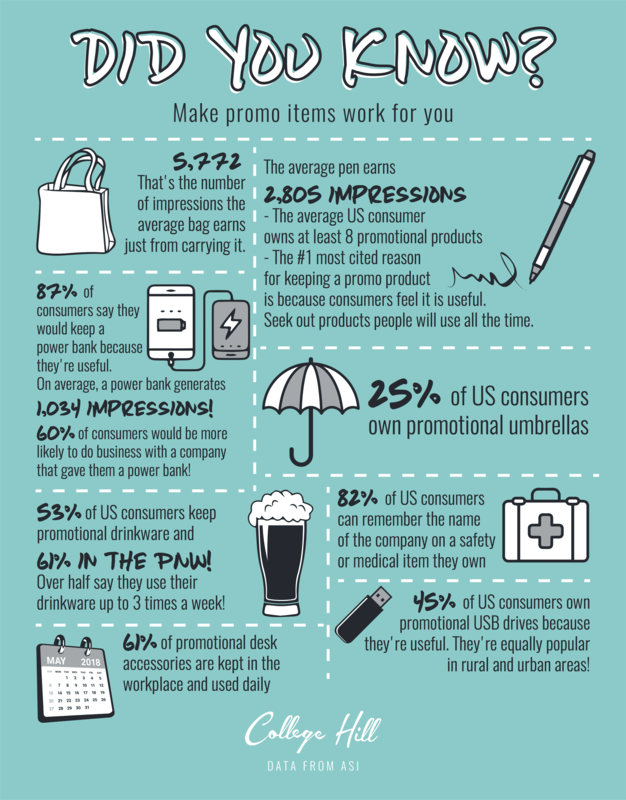 - As seen in the infographic above, there's an incredible return on investment with promo products. We produce them affordably so you can blanket your town with your name. These make great client gifts, giveaways, leave-behinds, mailers and more - whether you're looking for small items like USB drives or hand sanitizers, mid-sized items like umbrellas or drinkware or large scale displays like tradeshow panels, we can help you advertise your business in the most cost-effective, long term way possible. - The average billboard is tremendously expensive and the average digital ad, while affordable, is seen only once or twice. Your promo products are seen all the time - for months or even years! 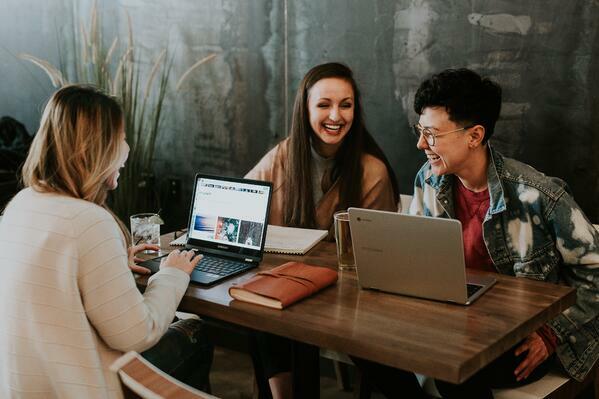 - Not only do the people that receive your promo products see them all the time, reinforcing your company name, but the people around them see them all the time, too. Every time that pen comes out at a meeting or someone passes by a desk calendar or someone is behind you with your company umbrella - people remember your name. Ready to inquire? Just click here for a quote and you'll get your first design back within 24 hours. Heading somewhere for Spring Break? 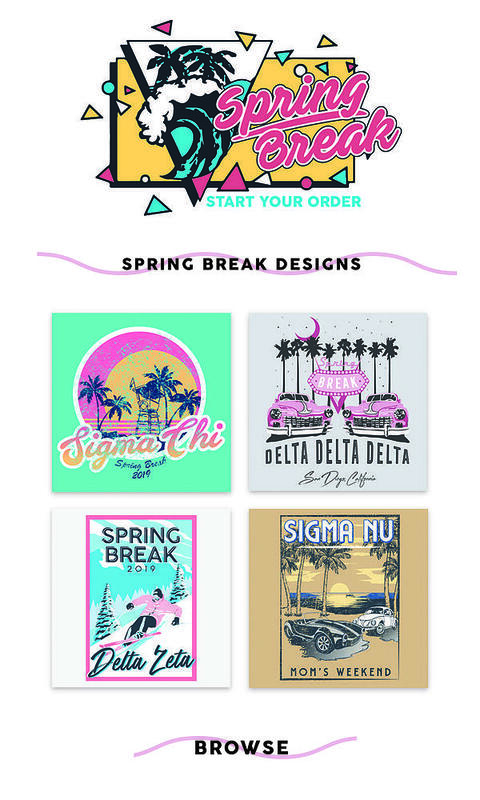 Whether you're heading to the beach, the mountains or even your local lake, spring break is just more fun with matching apparel. Custom tanks, tees, koozies, water bottles, you name it - we can do it. Choose from a ton of fun, colorful clothing or product options and customize them with a completely original design we make for you, or a variation on something you see in our design gallery! How many times has a boomer reminded you that college will be the best four years of your life? My guess is about seven times a day for the last decade. Here’s the thing, though – they’re actually not wrong about this one. College has been the most fun I’ve ever had in my life – over 21 years! Here’s why: I joined student organizations that made my time here more than worthwhile. 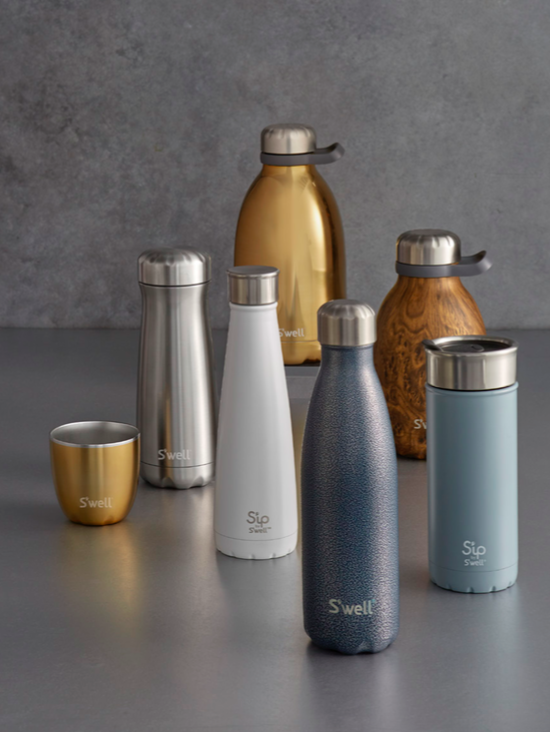 We're thrilled to announce that we're now carrying S'well and S'ip travel bottles for all your liquid needs. 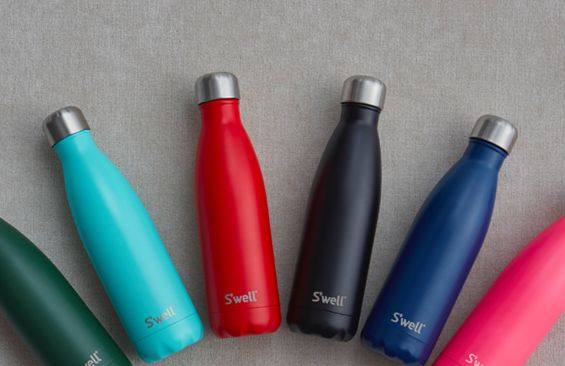 S'well is everywhere you turn, but S'well bottles with your business or organization's logo or custom design is available right here. Let us know what you're looking for and we will make it happen. Submit an order inquiry. - Let's admit it - they're trendy. We like that.